That feeling of leaving civilization behind as you move out of the valley and into the woodline is the inspiration for this series of fixed blades and folders. With an upswept tip, the cutting edge of the Woodline is long and flows into the overall design. The Woodline series of knives consist of both a larger fixed blade and a smaller folding blade design. At one time a smaller fixed version was offered but it was discontinued for 2012. Now for the meat and potatoes of this review. The Woodline fixed blade is a non-serrated, trailing point design which measures 264mm (8.4″) overall and masses 235gr (8.3oz); resulting in a large knife for belt mounted EDC. 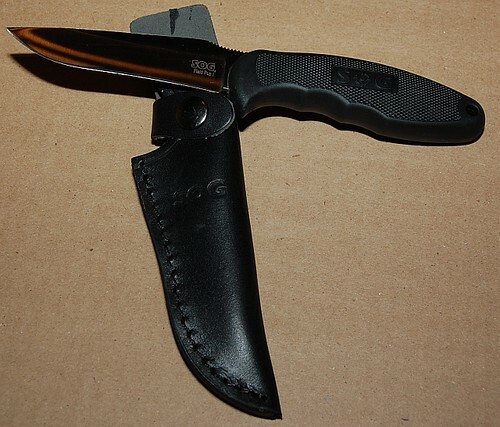 In the author’s opinion this is a field knife, carried and utilized in specific situations such as hunting, camping and other outdoor pursuits which allow for extra bulk and mass to be carried. With many thumb grooves on the spine and a large finger groove in the bolster, the knife has many good control features. The extremely long curved cutting edge of the Woodline’s 122mm (4.8″) blade designed to a good knife for skinning, and with the 3.8mm (0.15″) thick spine the blade can withstand considerable abuse. Made with the standard SOG material, 8Cr13MoV Stainless steel, the knife itself should be able to keep an edge well and be readily sharpened. On the back of the spine are numerous thumb grooves to aid in fine blade control, which is required to prevent unwanted cuts and nicks with the upraised blade tip. The bolster, the metallic section between blade and handle, is made from cast stainless steel and creates the large finger groove in the handle’s grip profile. The tang of the knife is completely encased in very smooth hard wood which is retained by a series of stainless steel torx head screws. The final accoutrement is a lanyard loop consisted of a stainless steel tube imbedded in the end of the handle. 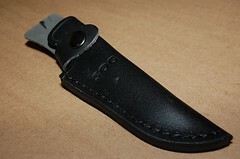 The sheath is composed primarily of 7oz leather with the reviewed piece having a nice uniform dark brown colouration. The leather sheath not only covers the entirety of the blade edge, but nearly the entire bolster and a small portion of the hardwood handle. 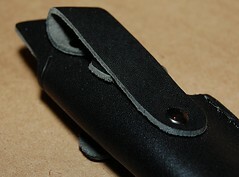 Blade retention is accomplished though a single leather strap using a press snap button. This strap wraps around the generous finger groove formed in the bolster of the knife. 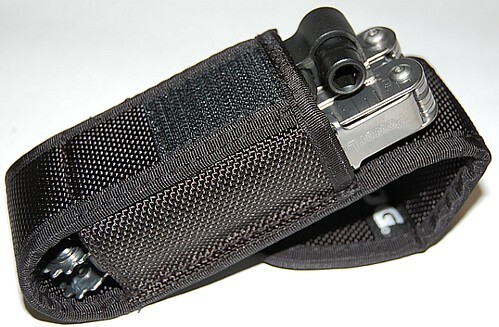 A single belt loop, also made from 7oz leather and 20mm (0.8″) in width, is riveted place. 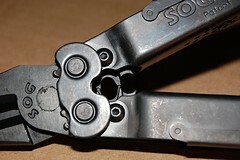 A basic SOG logo is branded into the face of the sheath. 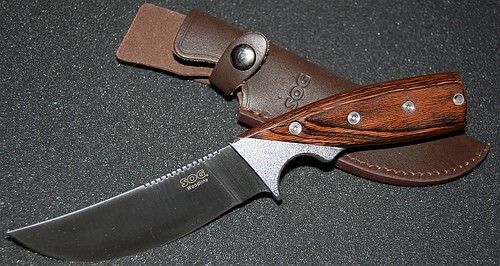 SOG’s Woodline fixed blade has nice curves and is complimented by the simple and functional sheath. The Woodline fixed blade knife by SOG is an impressive looking product , appears to be very well made and creates an attractive package with the dark leather sheath. The only additional observation which can be made by TPF is that the knife itself is made outside of North America, which does keep manufacturing costs down, but may affect the purchasing decision of prospective buyers. The SOG WD-01 Woodline, large fixed blade knife as reviewed by TPF, has an MSRP of $60USD and is available with many Canadian retailers including various Canadian Tires stores across Canada. The question, as always, posed to you, the reader, is whether this item is Tactical, Practical or Fantastical? SOG Twitch-II: A classic lock back upgrade? Once again Spring Assisted Openers are featured on TPF. 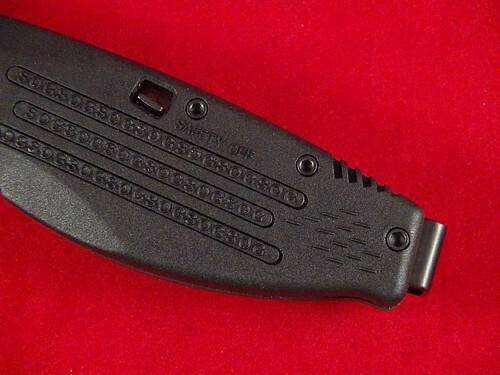 In this case, SOG Specialty Knives & Tools offered up a small everyday carry knife labelled the Twitch II. The original Twitch I, was introduced into the market many years ago and its small 48.3mm (1.9″) blade, with Spring Assisted Technology was the result of the imagination of Mr. Spencer Frazer. For those that do not know, Mr. Frazer is the founder of SOG (originally an anagram from Studies & Observations Group) and as a result, SOG has been designing, manufacturing and producing knives for the last 25 years. Having many patents with his name attached to them has helped SOG grow into one of the top dozen known companies for quality, innovation and customer satisfaction with their lines of blades and multi-tools. Fast forward to late 2005-early 2006, and the Twitch II was introduced into the commercial marketplace. A bigger brother to the original, the Twitch II is literally an up-scaled version of the Twitch yet it is not the largest in this design family. That title is held by the Twitch XL. However, for this overview TPF focuses on knife which sits in the middle of the pack. Featuring a flat ground, drop point blade, which measures 68.1mm (2.68″) in length; the Twitch II is a fair sized knife for EDC. 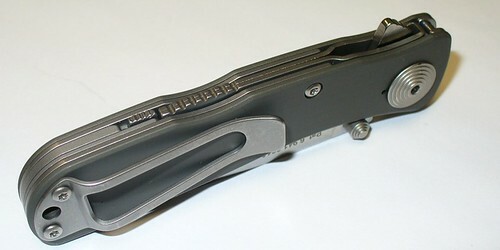 The biggest difference between this design of knife and other spring assisted opening knives is the use of a modified spine lock to secure the blade in the open position. Mounting dual thumb studs on the blade and a kick on the opposite side for opening allow for easy ambidextrous opening of the knife via thumb or finger. 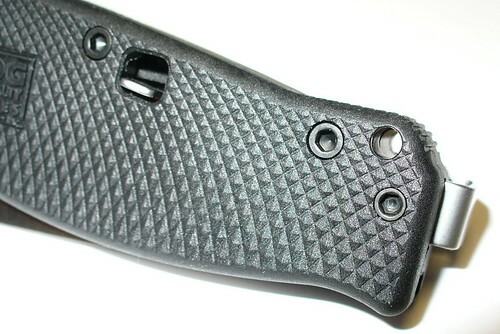 Part of the design is the formed lock back which fits around the kick when the knife is in closed position. The opening of this knife using the kick is very fast (see the attached video at the end). The Twitch II is not a grand knife designed to ohh and ahh people who see it, but is meant for users who may need a knife for everyday cutting tasks. 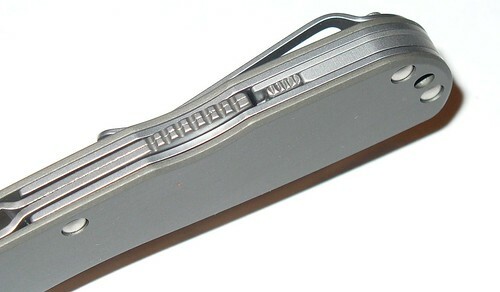 Tight, simple controls, and possessing a smooth appearance from the use of aluminum grip panels; the Twitch II appears to be a logical choice for upgrading from the classic folding, lock-back pocket knives that were carried by many. Non-Reversible pocket clip for tip up carry. Similar it may well be to those older knives, but the same it is not. The Twitch I & II have non-reversible pocket clips due to their sculpted shape, the bigger Twitch XL uses a clip similar to that of the previously reviewed SOGZilla. That being said, the Twitch II clip orientation allows for tip-up carrying while in the pocket and the clip is very small in profile to not have a significant visibility factor. The formed lock back lever and safety switch. Already mentioned was the innovative design style of the lock back lever which surrounds the kick yet allows it to move freely. In order to open the blade, the resistance imparted by the lock back lever must be overcome but this is accomplished easily and the blade opening speed is very fast. 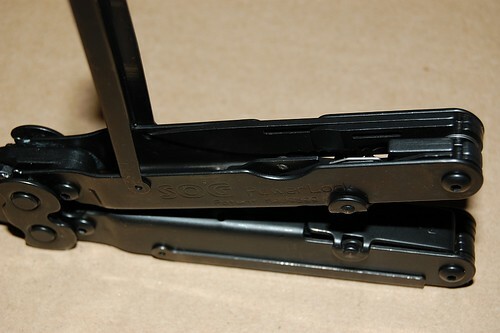 The folded sheet metal locking lever design is accompanied by a small safety slider which secures the locking lever into position. 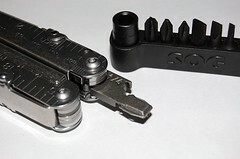 This enables the knife to have a blade secured in both open or closed positions. The safety has a definite mechanical stop in both engaged and disengaged positions so that it will not accidentally shift into an undesired position. Be aware however that the safety, while preventing the blade from fully opening, does not prevent the tip from extending past the handle by 3mm (1/8″) with direct force on the opening protrusions. Such an occurrence was tested and proven with the reviewed Twitch II, but did take a directed effort on either the kick or the thumb studs in order to open. Research into this shows that this is a rare occurrence and that the vast majority of Twitch II users have no such issues. Overall this SOG appears to share a hallmark feature that TPF has seen of other SOG products, a durable design meant to be well used. 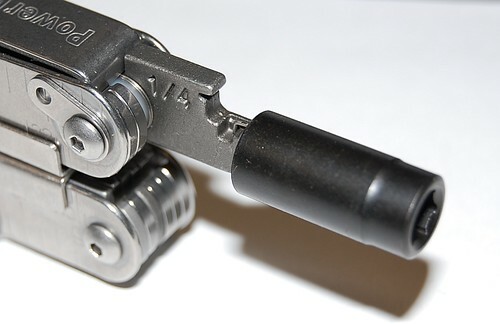 The Twitch II can be ordered as reviewed (TWI-8) but can have two other versions if so desired. 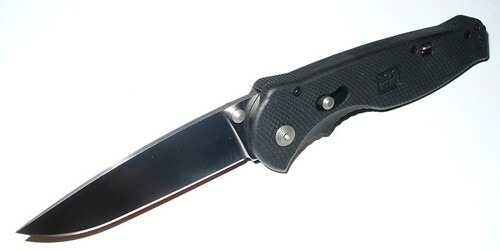 A partially serrated blade can be found (TWI-98) or a standard blade but with all components having a black titanium nitrite finish. (TWI-12). As reviewed by TPF, the Twitch II has an MSRP of $72.50 and can be found at a variety of Canadian retailers such as Warriors & Wonders located in Vancouver, British Columbia. As always the final say is yours; the reader’s. 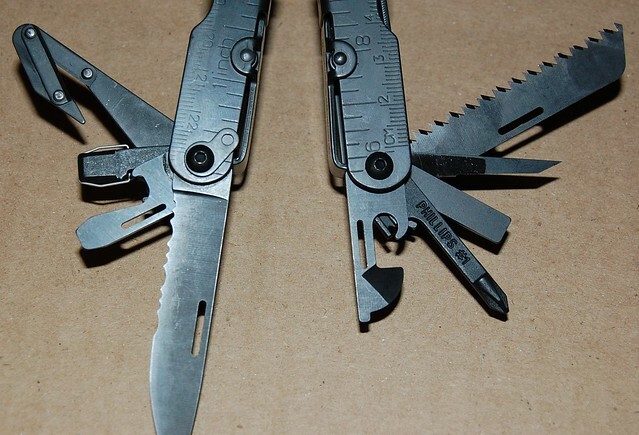 SOG’s Twitch II: Tactical, Practical, or Fantastical?